You have no idea what men of power can do! (SPOILERS) Kevin Costner’s best year was the one in which he found fledgling success, with the double-header box office hits of this and The Untouchables. Crucially, they were both very good movies. 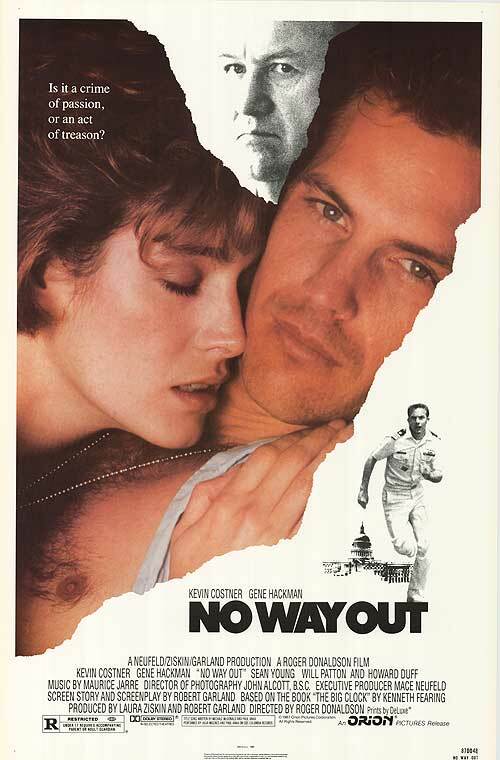 No Way Out is undoubtedly lodged as an artifact of the era in which it was made, with its Maurice Jarre synth score, and unavoidable dose of Sean Young. But as a thriller it stands the test of time extremely well, maintaining pace and tension throughout; this is easily journeyman director Roger Donaldson’s finest piece of work. It’s based on a novel by Kenneth Fearing that was turned into a 1948 film with Ray Milland, both titled The Big Clock. While those were based in the world of newspaper publishing, NWO pitches its tent in the Pentagon. Secretary of Defence Gene Hackman accidentally kills his mistress, who has also been seeing Kevin Costner’s naval officer, who in turn has been posted to the Pentagon to report to Hackman! It’s interesting to note the criticism that NWO’s twist ending has received (if imdb is anything to go by), the view expressed that it is unnecessary and is one unbelievable coincidence too many. The coincidences setting up the main plot are more of a hurdle for me; if you can get past them, then the discovery that Costner is Yuri, the rumoured Russian agent that Hackman and his assistant Will Patton decide to put the blame on, is icing on the cake of duplicity and deceit. I’d argue it works because it is not essential to the main plot; it’s more an ironic twist than a house of cards on which the narrative is based. And as coincidences go, I prefer the “of all the luck” one of trying to pin the blame on Young’s unidentified lover as a Russian spy only for him to be revealed as one. But much of the credit for not spending the running time dwelling on the illogicalities must go to Donaldson, who juggles the plates skillfully as Costner comes under increasing pressure. The slowly-forming picture that will identify him is constantly in the background (this and breaking into the government databases are a charming reminder of ‘80s low-tech), and increasingly frustrating elements are added to the mix (not one, but two witnesses that can identify him). The two Contra goons who seem to have the run of the Pentagon at Patton’s behest are a rather unlikely presence (although they provide several quality chase sequences), and the last minute doubt of Kevin’s pal George Dzundza seems a little artificial. Anchoring the whole are three fine central performances, all pitched slightly differently. Costner is subdued and earnest, bottling up that trademark righteous anger. Hackman could do this kind of part in his sleep, but he’s called upon to spar with a never-better Will Patton in most scenes, and it ups both their games. Patton’s advisor steals the entire film, just the right side of OTT. His performance has a slight whiff of Nicholson in The Shining in that you know there’s something not quite right with him from the first scene. He’s all twitchy energy and queasy rictus grin, making his descent into unhinged and antic disposition not entirely unexpected.